You can’t help but watch Eddie The Eagle and smile and, for the most part, the production is well done, except where I previously mentioned. The soundtrack somehow works, even though it probably shouldn’t. It's a bird, it's a plane, It's Super… oh wait, no it's not. It's simply a British Ski Jumper who came in last at the 1988 Olympic games and stole the world's heart. Based on a true story, Eddie the Eagle teaches us to dream big, persevere, and to view life through "rose colored glasses". Michael "Eddie" Edwards (Taron Egerton; Kingsman: The Secret Service) had dreamed of going to the Olympics ever since he was a little boy. Unfortunately, he was never very athletically inclined; but what he lacked in natural talent, he made up for in shear determination. He spent several years skiing, but when it came time to get sponsors to help pay for Olympic training, he was pushed aside. Undeterred, he decides to take up ski jumping instead. Eddie finds himself in Garmisch, Germany, where many of the top ski jumpers trained, determined to land not only on his feet, but also on the British Olympic team. When he meets former ski jumping champion, Bronson Peary (Hugh Jackman; Wolverine), Eddie pesters Bronson to train him. A cynical, washed up jumper, Peary is reluctant, but finally agrees simply to get Eddie out of his hair. Helping Eddie get to the Olympics, Peary isn't prepared for the sensation Edwards becomes, not because he wins any medals, but simply because he shows the world his enthusiasm, heart and determination to be an Olympian. 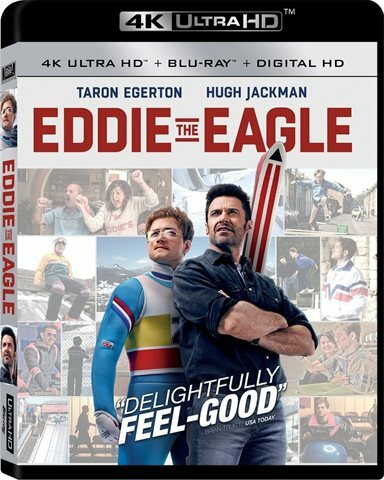 A fun, feel good movie, Eddie The Eagle is a showcase piece of acting for Egerton. Known for his transformation from streetwise kid to suave secret agent in Kingsman, Egerton transforms himself in a different way for this film. He embodies the spirit of a nerdy, optimistic, 20-something guy who only wants to realize his dream. Jackman is very good as Peary, but I suspect he wasn't necessarily as sarcastic or harsh as Peary probably was in real life. The picture quality is only as good as the filming, and there are moments when the 4k (2160p) Ultra High Definition video with a 2.39:1 aspect ratio clearly shows the graphic's flaws. Close ups of Eddie and Peary ski jumping are obviously "green screened" and come across as low budget special effects. Watching it in 4k only accentuates this. However, the color palette is the most vivid I've seen with the red and blues coming across particularly vibrant. The highly synthesized 1980s soundtrack is equally as cheesy, but sounds crystal clear in Dolby Atmos/7.1 Dolby TureHD Audio. The sounds surround you as you can't help but smile and move along to the music. Eddie's crash is also something to experience as you hear it from all angles, even behind you. The extras consist of 50 minutes of behind the scenes making of footage. This includes interviews with the cast and directors about the film, footage of how they captured many of the ski jump sequences and enjoyably, and a few discussions with Eddie himself, who is still stealing everyone's hearts with his positive outlook on life. Eddie's story is fairly unbelievable but certainly a great one to tell. His perseverance is something to aspire to and his pure joy of simply competing at the 1988 Olympics and realizing his dream is both heartwarming and awe inspiring. You can't help but watch this movie and smile and, for the most part, the production is well done, except where I previously mentioned. The soundtrack somehow works, even though it probably shouldn't. Despite its flaws, Eddie the Eagle boasts a strong cast, good script and, like Eddie himself, a lot heart. Watch it at least once. You won't regret it. Download Eddie the Eagle from the iTunes Store in Digial HD. For more information about Eddie the Eagle visit the FlickDirect Movie Database.